Old school Mountain Dew cans. Miniature moonshine jugs. Outhouse-themed ceramics. Are these mass-produced items of hillbilly, pop culture kitsch or valued items in a museum collection? Or maybe both. The Artifacts and Exhibit Studio of the Loyal Jones Appalachian Center at Berea College has a focus on documenting regional stereotypes of the region through objects and artifacts. The collection also concentrates on documenting mountain life from 1850-1940, regional craft traditions and Berea College history. Unlike a museum collection, these items have a primary purpose of educating the students. “We work close to faculty who teach Appalachian studies,” says Chris Miller, curator of the studio and associate director of the Appalachian Center. Berea started the collection 30 years ago, and then a decade ago shifted the focus to an Appalachian Studies teaching collection. When working with faculty, Miller asks “questions like, ‘What would you collect related to ‘x’ topic?’ The answer is often complicated or illusive, but collecting around stereotype is easy. There is a volume of stuff available,” he says. When presenting a selection of artifacts to a class of undergraduate students, Miller will ask “If you were creating an imaginary exhibit, what [object] would you choose and why?” he told The HillVille in a recent phone interview. The class along with Miller will then examine the object and discuss what the object can tell a viewer about culture or stereotype. When Miller began building this part of the collection, now about 50 items, he asked himself how to embody Appalachian stereotypes in three-dimensional objects; he visited eBay and entered the search term hillbilly. The search returned 3,000 objects, and after Miller eliminated items related to the ‘60s television comedy “The Beverly Hillbillies” and Hillbilly Jim, the wrestler, the refined search still offered thousands of items including gag items like teeth and hair to older items like a hillbilly-themed swivel stick holder from the 1950s, an item Miller says was common for home bars in the era. 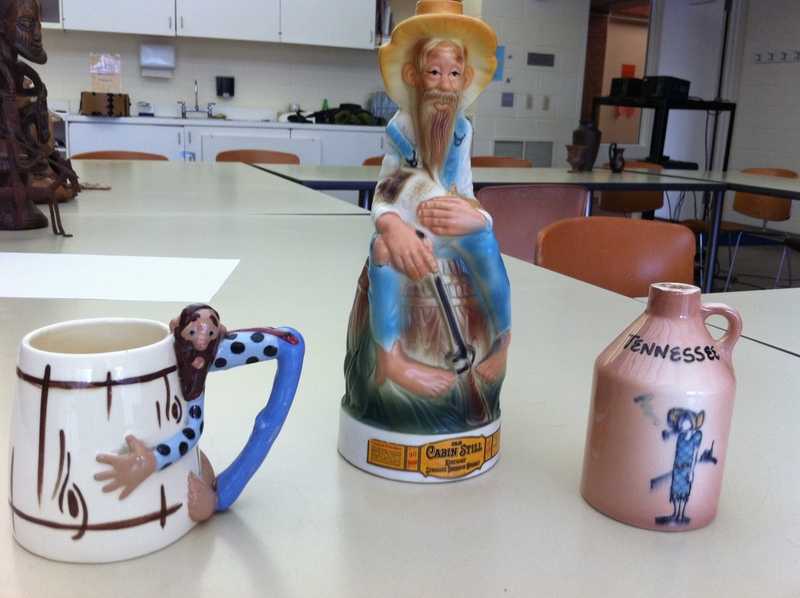 Ceramic items, such as these, often feature stereotypical imagery of Appalachian men as alcoholics or lazy. Photo provided by Chris Miller and Berea College. Many of the other criteria for collecting artifacts that document stereotypes of Appalachian culture involve humor or explorations of nostalgia. An important consideration before obtaining a new artifact is whether it is culturally pervasive or mass-produced. For the purposes of this collection, rarity of an item is not a priority. “It’s not important to know who made it or where it’s from, as compared to a handmade basket,” explains Miller, where uniqueness as well as identifying the maker is extremely important. “If [the item] is mass-produced, then it represents what was going on in the culture and [I can] connect it to our mission of teaching,” he says. “These are daily life pieces,” Miller says of the collection. Some of his favorites included a hillbilly-themed word game by Milton Bradley—a Boggle-like game called “Pull a Jug,” precursors-to-Mountain-Dew pop cans and a View-Master with images of the Smokey Mountains from the 50s or 60s, which documents a specific place during a set time. Being able to draw similarities and comparisons between items is one of Miller’s favorite facets of the collection. Together, the objects, “demonstrate how prevalent [stereotypes were] at certain time and how it took shape,” within the dominant culture, he said.